It’s important to protect your home from the elements, and the roof of your home is of primary importance in making sure to keep the weather out and keeping heating and cooling in. 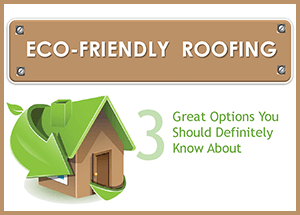 If you’re considering a new roof, there’s a wide variety of eco-friendly Portland roofing options on the market, many of them designed to last 50 years or more. Recycled metal roofing products provide many attractive advantages. They are beautiful, durable and shed snow buildup. Recycled metal roofing systems protect your roof from wind-blown sparks and embers, leading the way in home fire protection, and often netting discounts from insurance providers. Many of the recycled metal roofing products also come with a high-tech coating which creates a cooler, more efficient home due to the special reflective pigments embedded in the finish. Homeowners with recycled metal roofing products have reported saving up to 20% or more on their energy costs and many of these products are Energy Star rated which translates into nice tax savings. Sustainable roofing products made from recycled rubber tires are a beautiful and practical choice in the Pacific Northwest. These products are rain, wind, hail, impact and fire-resistant. As an added bonus, many homeowners comment on the difference the product has made in keeping their homes cooler in the summertime, and also about the superior sound-deadening qualities these products have to offer. Recycled rubber roofing was developed with the goal of diverting and re-purposing the tremendous deluge of used tires ultimately destined for the landfill. Between 600 and 1,000 rubber tires are used in the production of a roof for an average sized home. Once the roof has reached the end of its life it can be once again recycled. Scrap material generated during the installation process can be collected and recycled again, virtually eliminating environmentally harmful waste from entering the landfills. Advancement in recycled roofing materials and demand in the Portland, Oregon marketplace has made eco-friendly roofing a viable option for homeowners. If you’re interested, contact a roofer specializing in these products to find out if eco-friendly roofing materials will suit your project.